^ ﻿ZA4700: International Social Survey Programme 2006 (Role of Government IV)﻿ (Report). International Social Survey Programme. (2006). Variable V27: Q7c: Gov. 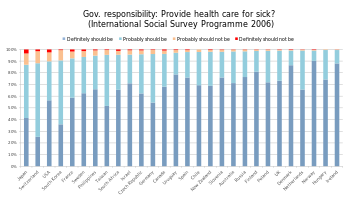 responsibility: Provide health care for sick. http://www.issp.org/.